This past weekend was spent relaxing and enjoying the hot weather that swept through L.A. I wore this silk romper on Saturday afternoon and transitioned it into night by pairing it with my favorite white blazer and heels. Since I've been in a black and white mood lately, I decided to add a pop of color to my outfit with a bright clutch. Happy Monday! Great outfit! I love hiw the clutch adds color to your black and white outfit! I am in love to your bag!! so beautifull! Great clutch! And it's from H&M? What a bargain! I'll have to look for that one! Me encanta la cartera! Que elegante es! What a beautiful look, love the clutch! Beautiful outfit, that clutch is stunning! Such a brilliant pop of neon! Love the pop of neon that clutch adds! I really love rompers, but my fiance tells me I look like a child in them. Maybe I need one like this to change his mind. Loving the clutch too! Love the elegant look of the romper....awesome pop of color created by the clutch! Have a great week ahead! You look so nice! I can't do rompers myself so I love to see others look great in them. That clutch gives a great pop of color to the outfit! Love this outfit! Black and white is definitely my favorite go-to color combination. this is the perfect outfit! Love every single thing! How fun is that neon clutch?! So cute! I spotted this clutch this past weekend... and you're making me regret not getting it. Might be headed back this week lol. LOVE this outfit! that clutch is so hot, perfect neon punch! Love the white jacket and the two-tone clutch. So chic! I love the POP of color from the clutch. It's such a pretty color at that. Such a cute look! Love how you added the pop of color! That clutch is amazing. Seriously amazing. You look beautiful! And you're right, the weather in LA this weekend was gorgeous. The hubs and I spent it on the beach...getting burnt haha. I love rompers and when it's black as yours mmm;) love how the clutch pops up! Love this romper! It looks so classy on you. The clutch is perfect with this outfit. Love how you made that romper uber chic! The neon clutch could not be more perfect, and oh wow! those pumps are adorable! Great outfit!Looks amazing!Love the clutch! Loving all of your items Audrey! As usual! You look so chic. I love your clutch! That H&M clutch is a beauty, so sad I missed the boat on that! you are so chic in black and white. i love the pop of neon! I love this look! It's very fresh and a perfect day to night look... The pop of color in the clutch is also a subtle yet stylish addition! Great look and smart to finish black and white look with a pop of colour on teh clutch! LOVE this outfit! That clutch is so gorgeous! *. * Love it! Love the shoes and the clutch! The all outfit is amazing! I love this look! The clutch is amazing! Loving the clutch with the pop of neon! Love this look, so lovely! The color of the clutch, especially orange, stands out with the black and white ensemble. That's a nice contrast. 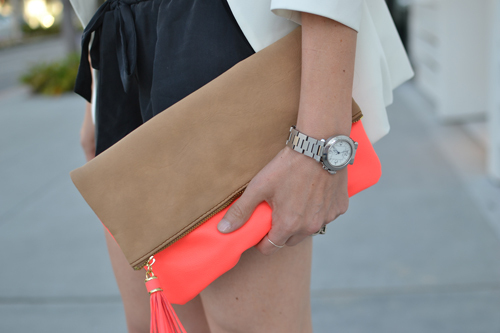 I love the monochrome colours in your outfit and then adding the contrasting neon orange of the clutch to your look! I love it! !